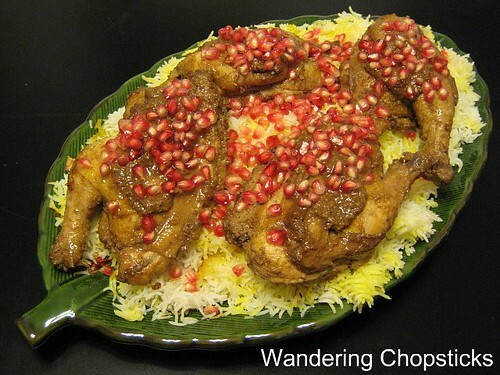 Fessenjan (Persian Roast Cornish Game Hens with Pomegranate-Walnut Glaze). There's a reason I left building traffic near the end of my series. I think it's far more important to build up your blog properly by setting certain standards such as being accurate, linking the right way, and giving credit where it's due. Once those aspects are in place, the quality of your content will shine through. So how do you go about getting noticed so others can see that content? Comment on other blogs. Most bloggers will click over to visit the people who commented on their blog. Maybe they'll like your blog, maybe they won't, but that's usually the first way people notice you. When I said earlier in this series that I dislike when people say, "That looks good." I didn't want to imply that I don't appreciate receiving compliments. I think we all love getting compliments. :) What I meant is that a bland comment like that does nothing to inspire someone to want to click on your name to see your blog. And the reality is, that like people who deluge bloggers with requests for link exchanges, comment-whores deluge blogs with comments so that you'll eventually visit their blog. Or you'll visit because you feel guilty that they're always leaving comments on your blog, even if those comments are exactly the same each and every time. "Now, go visit blogs and get your blog name out there by leaving quality, insightful comments (more than just “Great post!” is advised), and people will get curious and come and visit you...Now please don’t take this to mean that you should be visiting blogs willy nilly and leaving your mark like a dog. Too graphic? Ahem. Then how about this? Take time to read the posts of your fellow bloggers, carry forward an online conversation, and you will be rewarded with more visits." I'm not so great about visiting blogs and leaving comments. I usually let others initiate contact. So if you're like me in that respect, you don't have to go about leaving lots of comments everywhere, just make sure you respond to the comments you do get so the commenter will want to return. Banh Tom (Vietnamese Shrimp and Yam Fritters). Submit to FoodGawker and/or TasteSpotting. There's a slew of other food photo sites out there, but those are the two big ones. Initially, that's the only way I had spikes in traffic. I don't know if the demise of the original Tastespotting dispersed the readership, but traffic from those websites doesn't affect my blog as much as it used to. Or perhaps it's because the current editors don't like my pictures as much? :( I upload less nowadays. I view this as a good sign though since I continue to get steady increases in readership based on my content, not because of any placements. Don't take things so personally if your photo was rejected. My top photo of fessenjan? Accepted by TasteSpotting, rejected by FoodGawker. The photo of my banh tom (Vietnamese shrimp and yam fritter)? Accepted by FoodGawker, rejected by TasteSpotting. Yet Google fessenjan or banh tom and I'm on the first page. It's great to see my photos appear on those sites, but the success of the recipe itself shouldn't be dependent on placement. 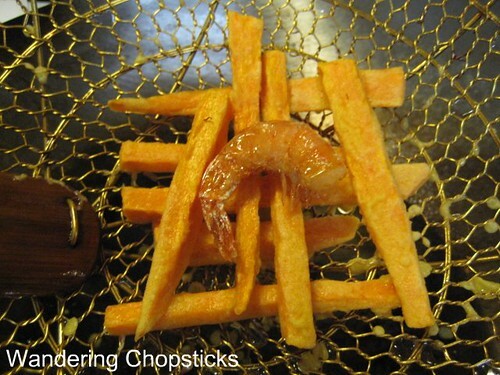 Participate in food blogging events such as Weekend Herb Blogging or Weekend Wokking. (Of course, I had to plug my own blogging event.) When I hosted WHB #135, I gained several new readers who discovered my blog because they were submitting entries. While those incoming links helped increase my blog's ranking, I participate in food blogging events because they're just plain fun. Where else can I get 14 fabulous recipes for coconut? I give full credit to the blogging event and creator, briefly mention what the event is, and include a logo. You can always tell who participates because they actually enjoy it because they include all of that info too. Those who submit to food blogging events for the links are the same people who link to recipes by saying they got it from "here." They do the bare minimum. Be courteous. Do you want others to link to your blog with the bare minimum? In that same spirit, if you're submitting to a food blogging event, please remember to thank your host. Round-ups take quite a bit of work and I'm always surprised when people don't thank the host. After all, you got a link and a nice mention, doesn't that deserve a comment or thanks? Bee and Jai of Jugalbandi have a calendar of blogging events if you'd like to see which ones you'd like to participate in. Other events may be found on Is My Blog Burning? and Sticky Date. Food Blog S'Cool has an awesome calendar with various food blog events and their deadlines. None of them are complete, so check all for links to different food blog events. You could easily go every day and submit to a different food blog event, but don't spread yourself too thin on the quest for links. Regular participation in a few key events is actually better. For example, if you want to host Weekend Herb Blogging, its creator, Kalyn's Kitchen gives preference to active contributors. I've had requests to host from people who've never participated in Weekend Wokking, or have only participated once. I can't help but think they want to do it just for the links. We all like getting links, but let's be courteous about it. Please? See my previous post about Giving Credit: The Right Way to Link, Copyright, and "By," "Inspired," and "Adapted" for the right way to link. 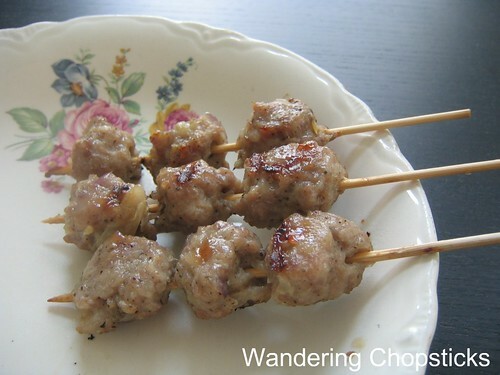 Nem Nuong (Vietnamese Grilled Pork Patties). Do you have your ping function turned on so Google and other search engines can find your blog? In Blogger, look under "Settings" and then the "Basic" tab. Make sure "Let Search Engines Find Your Blog?" is set to "Yes." Then learn how to pay attention to your stats. I use StatCounter.com. Some people use SiteMeter or Google Analytics. Stat counters are important for you to look at where your links are coming from, which posts are popular, and where people are clicking around on your blog. Marvin of Burnt Lumpia recently said he gets excited to see a comment until he realizes it's a comment on an old post. Don't dismiss old posts. In the Google search engine, it's not how old the post is that matters but what its importance is in overall page ranking. My nem nuong recipe, which TasteSpotting and FoodGawker both rejected by the way, continues to get hits every single day and is the first hit on Google. The recipe is more than a year old. I sometimes still get questions on it. And if that's the recipe and page in which people find my blog, that's their first introduction to the site. So it pays to respond to comments, even old ones. For popular posts, I've even gone back and updated them with better photos. Sometimes if an old post is getting hits, I go back to include a new relevant link. For example, an old post from last November of just pictures of loofahs on the vine was linked by a forum on how to live green. I clicked over and saw that they mentioned you can make your own loofah sponge. Since I had posted about this very thing recently, I went back to that old post and included a link to my recent post. That's one extra page view for each person who clicked on over from the initial old post. Google measures your page ranking based upon how long someone lingers on each post. This is called "bounce rate." You want to keep visitors from "bouncing" or exiting your blog. The more posts you have, the more pages get indexed into Google, and the more likely a visitor searching for a recipe or any other subject will find your blog. If they like that post and find it useful, they stay and read. Then they click to another page, and another page, and before they know it, it's been 4 hours. You've just hooked in a new reader and lowered your bounce rate, thereby increasing your Google rankings. How do you build up your blog's traffic? Do you comment a lot? Participate in food blog events? How often do you look at your stats? Do you go back and edit old posts? 1 year ago today, pollo alla parmagiana (Italian chicken parmesan). i post on tastespotting and cross my fingers that it goes up. my blog is so tiny that it creates a ginormous spike. then it kinda slowly grows from there. i want to try some blogging events, but theres so many, i don't know which to try! Count me in for the "thanks for blogging tips"! It's really good info, and I've shared it with a ton of others. One thing I was wondering is where did you find out how to have a the popup comment box? I've searched blogger help...well a little anyway...and didn't see it. Thanks in advance> And not to be the vanilla commmenter, but your pics and content are really great! And thanks for visiting my blog as well. Should you get back to Portland let me know if you want to go to Apizza....w and I live super close and I'll walk over and put your name on the list!! thanks for this post. I have been having a bad day at work, and then i got rejected from food gawker and tastespotting. it is nice to know a site as a good as yours sometimes gets rejected. You know, when I started blogging, I did it out of the love for writing which I had since young and of course, enjoying the photography part as well. I still do....(which is why I had so many blogs) and since it is a hobby and something which I enjoyed doing very much on a regular or even daily basis (when I can), I didn't really pay much attention to the traffic or monetary part. I just wanted to write, take photo, etc. It was really fun getting to be noticed and also, I realized I am meeting new people along the way. great tips (and lovely pics). Thanks! I'm glad you're enjoying the series. What new things did you learn? Well, you should always start with my blog event. ;) You just started. It'll grow from there. Don't worry, all in due time. Go to "Settings." Then "Comments." And then the third item is "Comment Form Placement." Click "Pop-up window." Glad you're enjoying the series. I'll keep that pizza offer in mind if I'm ever up there again. Don't take it personally. I know it can be disheartening but placement shouldn't matter so much in the whole scheme of things. It's just the subjective opinion of one, or two, persons. "oh definitely should do that." "Yeah that's worked for me too." "That's what I do too!" How do I build up my traffic? I use to submit to TS and FG but I find that TS accepts more of my pictures (go figure!) so I just do TS now. I also participate in foodie events. You get alot of exposure/linkage that way. My baking group, Tuesdays w/ Dorie, has brought me alot of traffic from the other 299 bakers but I notice that I get more comment love when I comment on their blogs too so I try to reciprocate when I can but sometimes life gets in the way. I use to look at my stats alot when I first started. Now I glance at them once in a while but not as much anymore. I realized early on that if I enjoy what I am blogging about that is the post that bloggers enjoy reading so I try to focus on my own enjoyment first. I rarely go back and edit old posts but if someone comments on an old post I'll reply to them. Keep those blog tips coming! FG and TS...i love things who RSS my blog so that i don't have to upload (oh my lazy azz) but i guess some relationships need more work than others, eh? Oh yes, those Daring Bakers and Tuesdays with Dorie really bring in the comments. It's hard though! I'm not much of a baker and to keep doing that every week and every month. Insane! I totally agree that if you really enjoy what you're doing, others will enjoy it too. Haha. Yes, there really is a blogger who doesn't say anything except that again and again. Not you though! There are so many blogging events, I can't keep up! Hi. I am a new blogger. Old to the food world but new to blogging about it. I just found and read all the way through your blog tips. I found it very interesting and informative. Thank you for posting such a useful bit of information online. I hope that I can take some of your tips to heart and become a prolific and PC blogger. Thanks again. Welcome to food blogging! It's a lovely community and I hope my tips were useful. Just all the stuff I wish I knew when I started out. Hi. I've being checking your blog lately and found it very honest and profound in content. I'm kind of new on food blogging and still have thousand things to learn from you all great bloggers. Is true we tend to follow those "cute" blogs with nice pictures but at the end a good food blog should be about good food. I've seeing your recipes and truly like them. I find your site inspiring. ps. and thanks for the amazing tips!. Profound? Well, I don't know about that, but thanks for saying so! :) Thanks for such nice words. I hope you find this series, or my blog useful. WC ever since you wrote this series of posts I find myself returning to it and referring to it frequently. Whenever I see someone else has used one of my recipes and posted it on their blog and I see a "find this recipe here" I CRINGE! I want to send them a link to your site and tell them to learn proper blog etiquette! I still cringe! And seriously, if we cringe when people use our info but don't acknowledge it, surely they don't want the same thing happening to them? Or perhaps they do and they want it to look like they came up with it all on their own? Thank you so much I have been wanting to start a food blog for a long time actually started with 2 posts about 9 months ago and now after reading your tips I am going full steam ahead!! Thanks for all the good advice and helpful links!! Have a great food journey!!! Good luck! I wrote about three posts when I started and then nothing for three months before picking it up again. Thank you for the tips! I've had a food blog for a while but didn't know how to increase its traffic. I've just registered with FoodGawker and TasteSpotting, hopefully that will help. I have a question though: if I don't write recipes but do want to join in the food blogging events, what should I do? Are there events for non-recipe bloggers and where can I find them? Unfortunately, I don't know of any food blogging events for restaurant review sites. You can check the links I have to the aggregate links of food events and see if anyone started any.